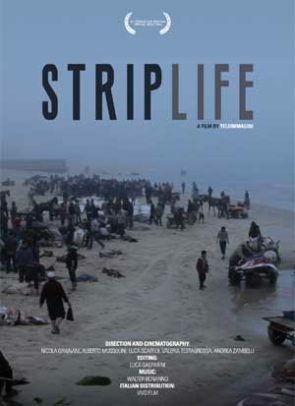 Striplife is a choral movie telling the stories of Gaza strip. In the space of one day, characters’ stories meld with the environment. Men and women capable of tenderness and smiles, holding out against seemingly impossible life conditions. Not a movie about Gaza, but with Gaza. Gaza strip. Something inexplicable happened during the night: dozens of manta rays beached. Many fishermen rush to grab them. In the meanwhile, the city is waking up. Antar wakes up his brother: it’s the big day, in the afternoon he will be recording his first album. Noor puts the make-up on, she will have to be in front of a camera. Jabber is already on the pitch. Around him guns fire. A demonstration walks through the streets. Moemen is there to do his job, he’s a photographer. At the docks, a ship comes back full of bullet holes. The voice of a muezzin singing is amplified by minarets. Like a dream, the boys of Parkour Team twirl around a graveyard.